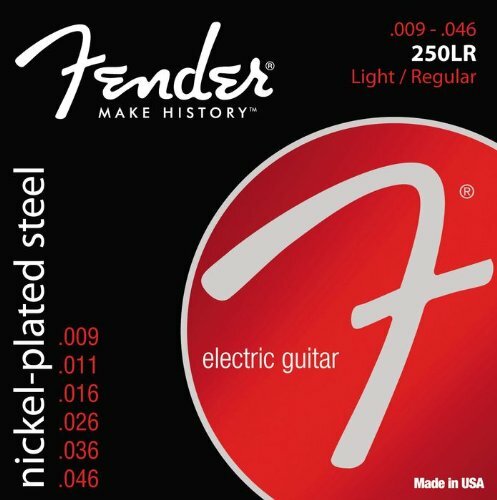 Fender® 250LR Nickel Plated Steel Light/Regular Electric Guitar Strings are plated Nickel Strings on steel that have the sleek feel of nickel strings with the power and dynamics of steel strings. These Light/Regular ball end Guitar Strings 09-46 are just one of the renowned products designed and constructed by Fender. With their unsurpassed reputation, Fender® continues to be the 1st choice for instruments and products world wide. These guitar strings are no exception. They are a high output string and are extremely versatile in almost any music style. With these Fender® electric guitar strings, your sound will shine through. Fender® only uses the finest materials and metals to bring you the best strings possible. Ball end.